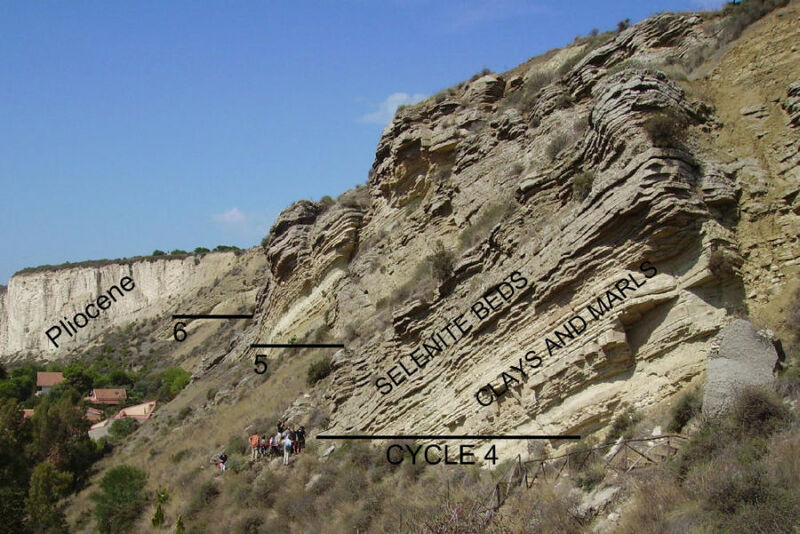 Outcrops of salt-bearing and gypsum-bearing sediments in the Mediterranean region were already noted by geologists in the late 19th century. In 1849 the Italian chemist J. Usiglio conducted evaporation experiments with seawater along the French Riviera and established the order in which evaporate minerals precipitate. It seemed clear that the salt deposits cold be explained by changes in the distribution of sea and land, but the extent and thickness was impressive. Karl Mayer-Eymar (1826-1907) a Swiss geologist and palaeontologist, dated the sediments by fossils in the Miocene Epoch and in 1867 named the period the Messinian, for the Italian region of Messina. The formation of these deposits however remained a riddle. In 1961, seismic surveying of the Mediterranean basin revealed a geological feature some 100-200 metres below the seafloor. This feature, dubbed the M-reflector by its strong property to reflect the seismic signals, closely followed the contours of the present seafloor, suggesting that this presumably compact layer was laid down evenly and consistently at some point in the past. New and high quality seismic data on the M-reflector were acquired in the Mediterranean Basin in 1970, at the same time the M-layer was cored during the Leg 13 (Site 124) of the Deep Sea Drilling Program conducted from the Glomar Challenger under the supervision of co-chief scientists William B.F. Ryan (specialized in geophysics) and Kenneth J. Hsü (specialized in sedimentology). One of the goals of the two young scientists (criticised by some older colleagues as "student and amateur") was to reach the mysterious M-layer. Only the second attempt in the Balearic Basin off the Spanish coast was (sort of) successful, the drill string begun to vibrate and finally got jammed. Recuperated the drill bit only some loose debris could be collected from the deep underground. Ryan and Hsü along with palaeontologist Maria Bianca Cita begun to study the apparently disappointing sample, but soon they discovered some strange properties. The debris consisted of basaltic rocks, white limestone, transparent crystals of gypsum and microfossils. Especially the microfossils were interesting; shoal-water foraminifers, but also tiny mollusc shells. According to Cita the organisms were small and underdeveloped, maybe as response to an extreme environmental stress. Ryan and Hsü soon recognized that the basalt clasts were cobbles and pebbles formed by fluviatile transport, the limestone and gypsum the remains of a sabkha and the micofossils inhabitants of a hypersaline lake. To form such a succession of lithological facies in situ only one explanation was possible: the entire Mediterranean Sea disappeared some 7 million years ago. 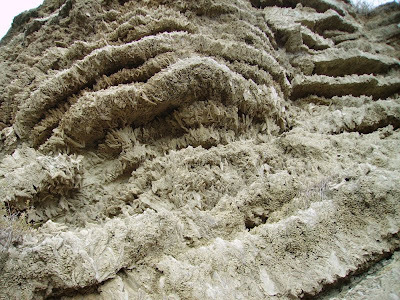 This desiccation hypothesis caused mixed reactions by the scientific community, and is still under scrutiny today, especially because this relatively recent event could maybe represent a model to explain large evaporate deposits in the geological past. Even today the Mediterranean Sea is characterized by a semiarid climate with low precipitation and high evaporation. The amount of fresh water flowing into the sea by rivers is not sufficient to compensate the loss; however the inflow of 2.000 square kilometres per year from the Atlantic Ocean trough the strait of Gibraltar holds the Mediterranean Sea level constant. If this connection would be sealed, in only some thousand of years the Mediterranean Sea would almost evaporate completely. During the late Miocene - the Messinian Stage (7,2-5,3Ma) - tectonic forces between the European and African plate pushed up the Spanish Sierra Nevada and closed the strait of Gibraltar. By the evaporation of the seawater various evaporitic minerals became deposited like halite, anhydrite, gypsum and others, forming finally a succession of sediments incredible 2.500 meters thick. Most of these evaporates still lie hidden underground or under the bottom of the sea, however in Italy these sediments became uplifted by tectonic forces during the orogenesis of the Apennines. On the southern coast of Sicily, near the village of Eraclea Minoa, in the Messinian sediments at least six cycles can be observed, from beds of gypsum crystals to fine laminated marls and claystones to crystalline layers of selenite, capped again by sandstone. Fig.1-3. Outcrop of Messinian evaporitic sediments at the Eraclea Minoa site in Sicily. The resistant gypsum beds are less eroded by weathering processes than under- and overlying marls. The upper crystalline selenite domes (in Italian called Gessoso-Solfifera, fig.2.) of cycle 4 were formed in shallow lagoon conditions and are cropped by fine laminated marls and gypsum beds (Balatino, fig.3.) at the base of cycle 5. 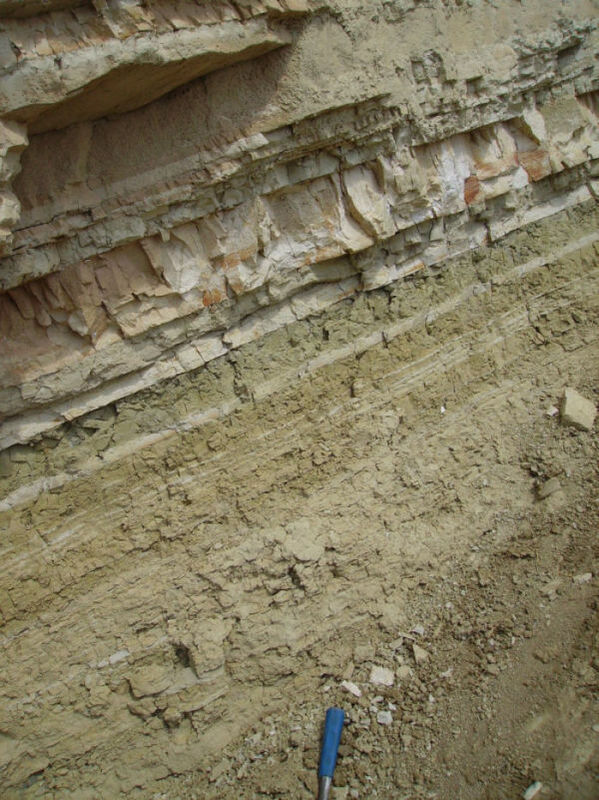 In the background of the photo cycle 6, characterized by much thicker marls and claystone deposits than the previous cycles, is recognizable, covered by the Pliocene. The base of the Pliocene (GSSP Messinian-Zanclean 5,332Ma) is formed by the sandstone of the Arenazzolo-Formation, followed by grey marls of the Trubi-Formation. The base of the succession is formed by reworked debris of basaltic rocks, followed by conglomerates, sandstone, laminated marls and evapoitic layers. In the sediments various cycles of marls and gypsum beds are recognizable, it is not completely clear if this succession is the result of repeated flooding and desiccation of the entire Mediterranean Sea (if so, at least 24 such cycles are recognized) or local events in tectonic active basins. Fig.4. Example of the Messinian succession of facies from the section North-West of Alba (Tertiary Piedmontese Basin) as drawn by the Italian geologist Sturani in a Seminar in October 1975 (LOZAR et al. 2008). The section starts with silty clays and marls of a normal marine environment, truncated by sand, silts and clays followed by silty clays with stromatolithic limestones. Here we observe a decrease of depth from a intermediate depth facies to a shallow lagoon with first evaporitic phases. In a restricted lagoon clays with lenses of early diagenetic selenite form, changes in water circulation occur as indicated by the fossils and a succession of silts, silty marls and sand beds. Then in an alluvial plain or marsh evenly bedded, massive clays were deposited. 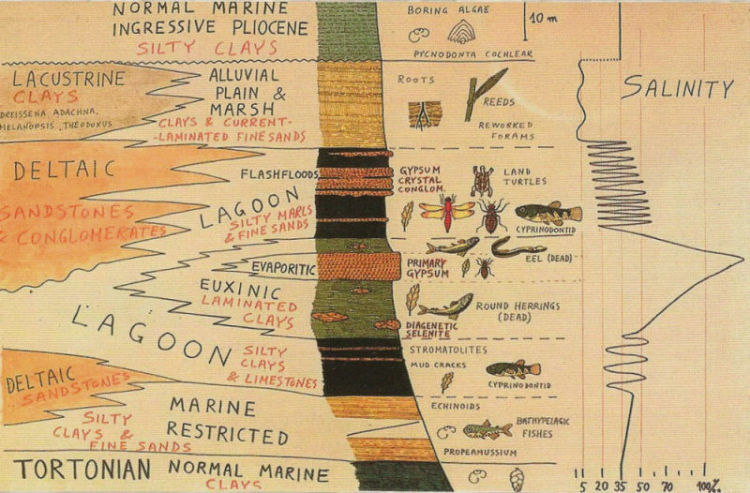 The entire section is cropped again by normal marine, Pliocene clays and marls. More than 5 million years ago the sea finally returned to stay. 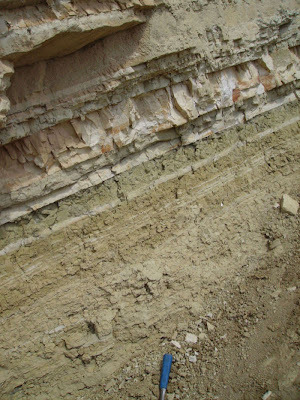 The entire evaporate succession is cropped by marine sediments, first the Arenazzolo-Sandstone of the brackish Lago-Mare-Unit and then deep sea turbiditic marls of the Trubi-Formation. The following video from the TV-documentation "Europe: A Natural History/Wild Europe" (2005) oversimplifies the story and presents uncritically some inaccuracies, like the reconstruction of a surprisingly narrow dam at Gibraltar and the infill of the Mediterranean Sea directly by the modern strait (there was probably an episodic connection to the Atlantic more to the north), but it gives a graphic and overall idea of the event.